Welcome to February’s Fabulous Finds Friday giveaway! Yay! I have a love for aluminum. There’s just something about the soft silver color that I find so appealing, and put that together with roses and, well, it’s pretty close to perfect. For this month’s giveaway I went into my stashes because I have more aluminum finds like this than I could ever possibly use, and it’s time to share the treasure. 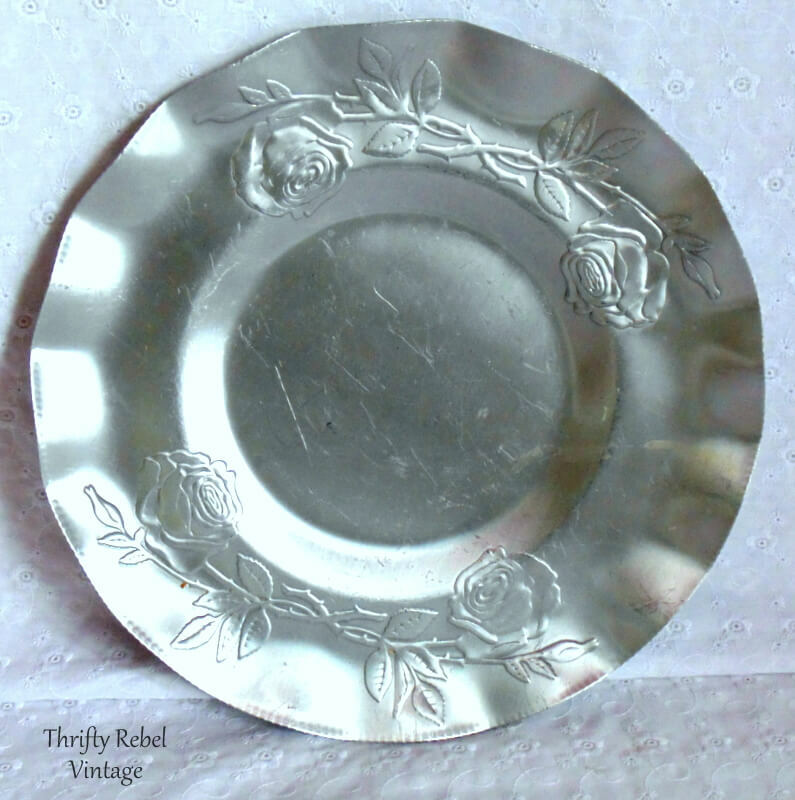 These vintage aluminum embossed rose pieces are so pretty. From my research they probably date back to anywhere between the 40s to the 60s. All were found at thrift stores separately, but when put together them make a lovely set. This 12″ tray has a great patina and some scratches, which is to be expected with vintage pieces like this. I like to imagine who might have used these trays back in the day. Here’s a matching 10″ tray. 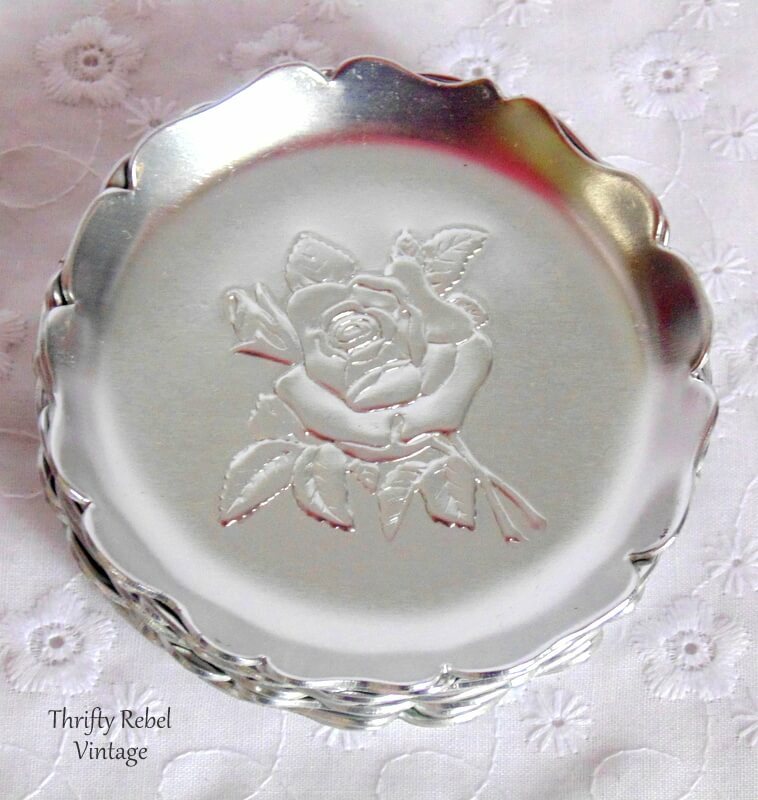 I’ve always loved the details in the roses and leaves in these trays, and the fluted edges add a nice effect. 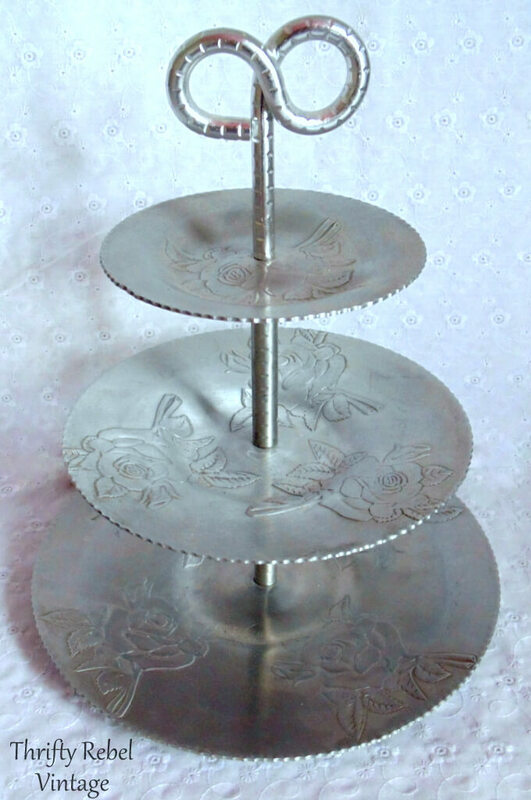 This fabulous tiered stand is about 12″ high, and while it has a different embossed roses pattern than the trays I think it goes beautifully. To give you an idea of size, the bottom tier is just under 10″ across. Here’s a better view so you can really see the embossed roses. 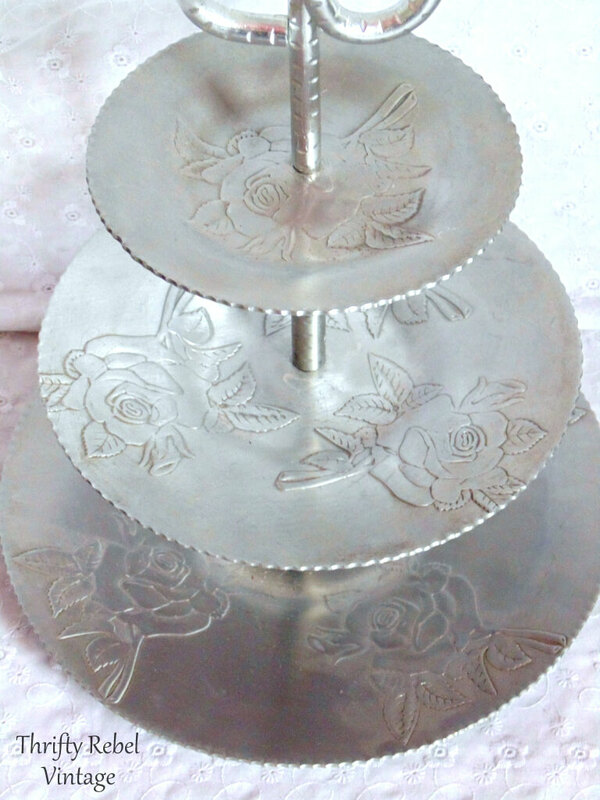 And to top it all off is a set of 8 vintage aluminum rose embossed 3″ coasters with a lovely edging detail. As much as I love these pieces I’ll be so happy to send them to their new home. Pretty things should be used and appreciated. For your chance to win this lot enter through Rafflecopter below and leave a comment on this blog post. Love vintage Aluminum and several pieces. Lovely idea. Love this grouping. Something new to start collecting, lol! I can picture those lovely pieces in my house. Thanks for the giveaway. Very nice find. You are so generous to give them away. These Photos brought back some old but beautiful memories from my younger yrs. 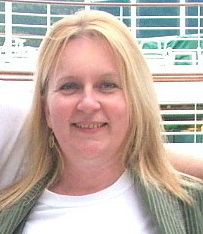 I am from a family of 11 children and my mother had a couple dishes and a 2 tier cookie dish which she cherished. With 11 children to feed & dress there wasn’t money left to spend on these type of extra items. I have no idea where or how she obtained these few pieces, as I was young but do remember how she cherished them & at all holidays and our birthdays these piece were the centre pieces of our Dinner Table! I Have no idea what ever happened to them, but I do remember birthday cakes, cookies and special desserts were placed on these special pieces and how Happy they made her!. 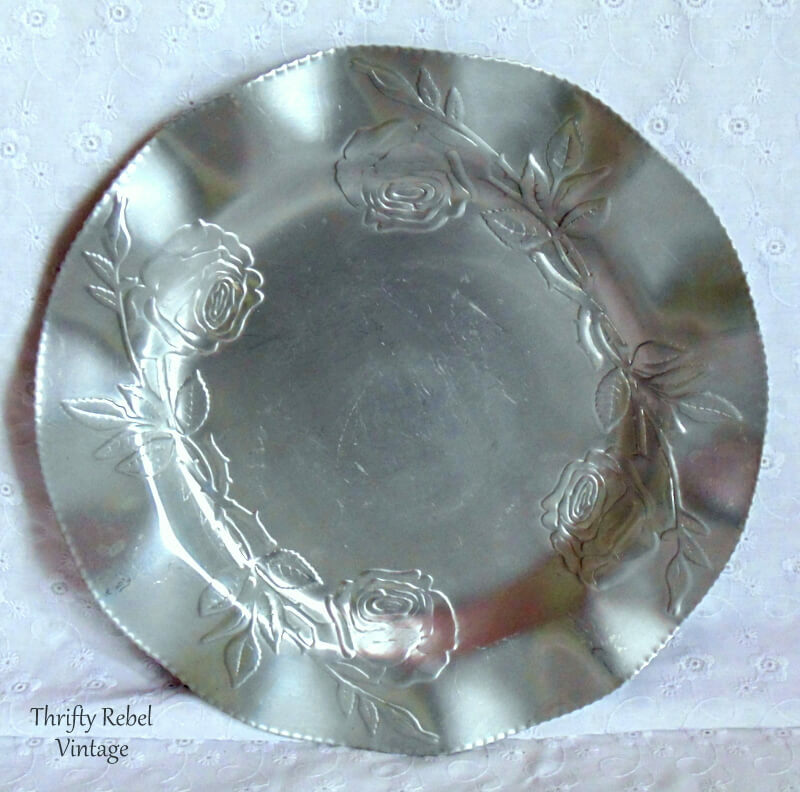 THANK YOU FOR THE MEMORIES…..
Love the vintage aluminum and roses are my favorite! These are some really wonderful pieces. Thanks for your generosity and the great giveaway! I remember my Grandma having the tiered one on the coffee table and it always held butterscotch candies from See’s! I would absolutely love to win this giveaway! These are beautiful and I would love to own them. I just recently bought a rose comport that would compliment these pieces nicely. I hope I win! Thank you for this chance. /great pieces!!!! I can picture some crystals and silverware combining with a piece or 2 for some cool wind chimes! Thanks so much for the generous giveaway! Oh my gosh! These are just beautiful – thank you for sharing!!! I love aluminum too! These are beautiful pieces. How very generous of you to give the pieces away. I’ve never seen these before. They are beautiful & you have a whole set which is a special. I can see the trays hanging on my wall. It’s lovely! My mother had something similar, unfortunately, it went to someone else. The roses are a great find! Great set Tuula! They take me back to some great memories also. I am happy to say that I still have the large rectangular tray with handles on both ends that my mother used to serve a pot of tea and cookies to guests at Thanksgiving and Christmas gatherings. I really like the coasters, I have never seen them before. Nothing is better than items that instill great memories! What a beautiful set! I remember having these when I was growing up. Always loved them! Thank you for the change to win. I love the look of vintage metal. And the best part about this set is it will coordinate with every season and holiday! What a generous give a way! I do hope you don’t regret parting with these treasures because treasures they are! I love that tiered stand! It all is so pretty. You could have sold all of this. So nice of you to offer for your giveaway. I have a little square glass dish with an aluminum cover with a wooden knob from either my Mother or my Grandmother. Not sure who actually owned it but I just treasure it. 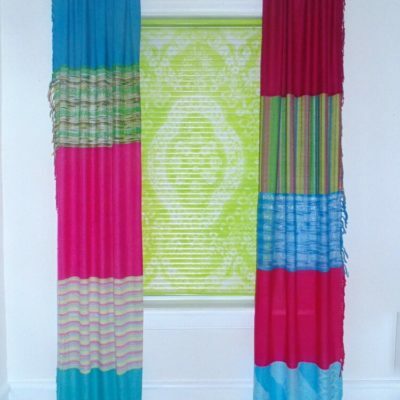 These pieces are fab! So vintage, so pretty, and I love how the rose details show. Thank you for offering them to someone to win, and to give them up after caring for them is above what anyone would expect. These are all lovely. Who ever wins these will be very lucky. Good luck to everyone. I remember these from my childhood, all those ladies teas from the ‘50s and ’60s demanded wardrobes of serving pieces. Thanks for the trip down memory lane! Wow, hard to believe you found them separately! They definitely look like a set. Beautiful! Love these! I have an old tray I made in junior high out of aluminum. These would match perfectly with the tray. These are soo beautiful! I love the way you showcase your items – and you always have such fun fabulous finds! Thanks for the generous chance to win! Roses are my love and this would be a wonderful set to “re-love” as I’m sure the items had a wonderful life before. I love all your beautiful wind chimes and so enjoy your creativity in making them! Keep on keepin’on!! I love this aluminum set! I have a rectangular serving tray with embossed chrysanthemums on it that I still use. These really bring back memories, and I can picture them being used at their monthly “card club”! ? This is such a great collection. It is so fun to find treasures like these at thrift stores. Thanks for the opportunity to enter your giveaway contest. 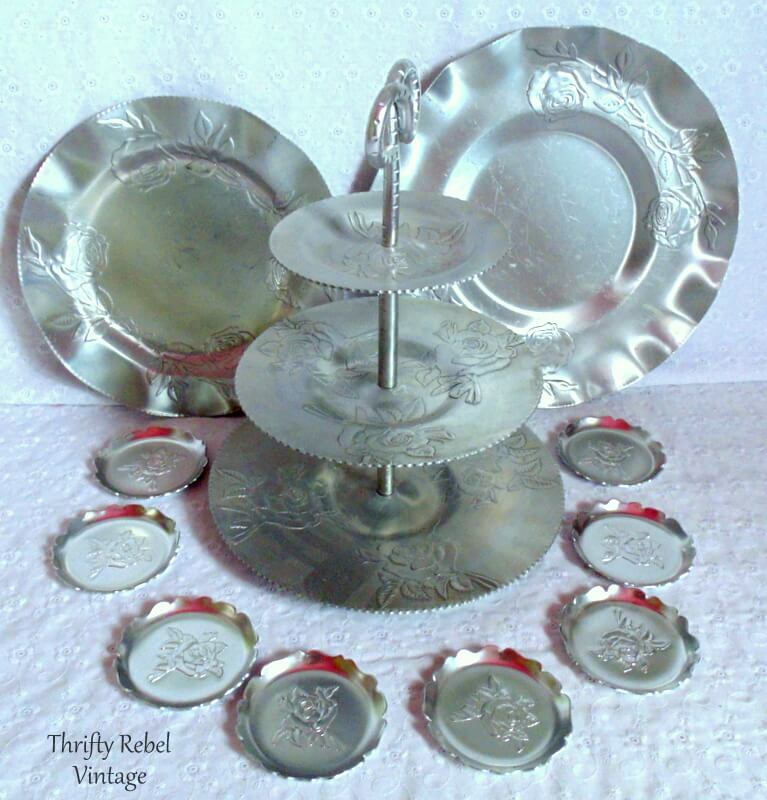 I’ve always loved these aluminum pieces too & I adore the tiered trays. 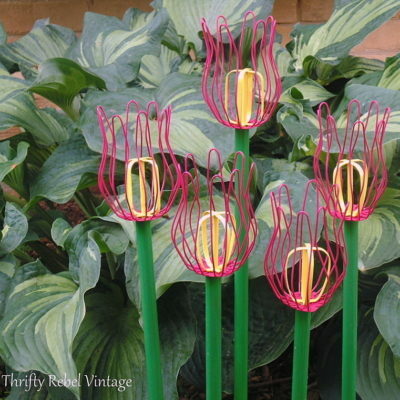 I’ve never seen anything like it before in the aluminum, but fab finds Tuula! Of course, I’d love to win them, but if I don’t, I wish whoever does will enjoy these lovelies!